The search for life's origins and evidence for the pathways of its early evolution are two of the most important fields in paleontology, especially as this research informs the search for life on other planets. Evidence from a variety of sources is used to develop the debate, but as yet no consensus has emerged (Table 15.1). Molecular evidence points to a single common ancestor for all life on Earth, which makes it extremely likely that life evolved here, rather than being brought from elsewhere, as has been suggested in the past. This, in turn, constrains the timing of the origin of life on Earth. From its formation until around 3.9 billion years ago, the Earth was bombarded by enormous meteorites. It is considered unlikely that life could have survived this bombardment, so life must have evolved less than 3.9 billion years ago. Unusual carbon spheres from 3.8 billion-year-old rocks at Isua in Greenland are interpreted by some workers as the remains of simple cells. 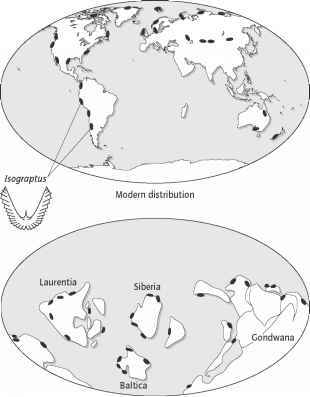 Cell chains and stromatolites have been reported from rocks around 3.5 billion years old from Australia (Fig. 15.1), though these are now disputed. Isotopic evidence suggests that life evolved the ability to produce complicated biochemical pathways early in its history. Modern photosynthesizing organisms draw carbon dioxide from the atmosphere, and preferentially extract more of the lighter stable isotope of carbon, 12C. A light carbon isotopic signature is evidence for photosynthesizing organisms. It may be present in the Isua rocks, and is certainly common in rocks less than 3.7 billion years old. Biological evidence cannot accurately date the origin of life, but suggests that it lies within a group of simple bacteria, or prokaryotes (Fig. 15.2a), called hyperthermophiles, which are adapted to life at high temperatures. This may indicate that the location of the origin of life was in hot spring environments, or close to mid-ocean ridges. Taking these lines of evidence together suggests that life evolved soon after Earth became stable enough to sustain it. They also suggest that life quickly passed through a range of simple stages to produce complicated metabolisms within 200 million years of its origin. Fig. 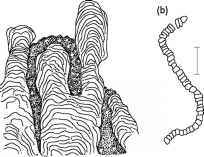 15.1 Possible early fossils: (a) an Archean stromatolite, and (b) a string of what may be prokaryote cells. Fig. 15.2 (a) A prokaryote, and (b) a eukaryote. Note the internal organization and larger size of the eukaryote. Table 15.1 Summary of the main lines of evidence for the timing of the evolution of life.